While we were in Kinshasa last month we had the amazing opportunity to visit a brand new facility that Our Family in Africa will be supporting in DRCongo and it will be called "Our Family Orphanage". 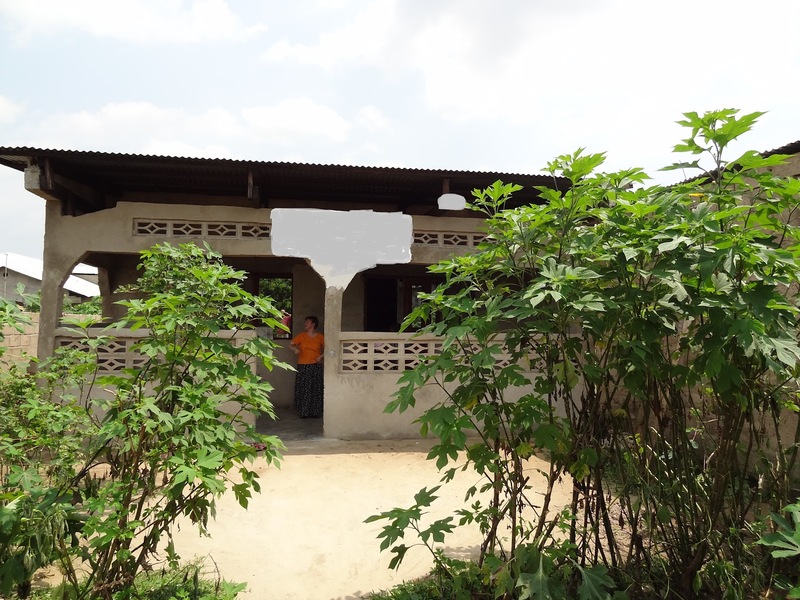 It is a very small children's home that will be run by a long time partner of OFA. It will house no more than 10-12 children at one time, so it has more of a group home type atmosphere. Some of the children may be eligible for adoption. Others will stay in the home until the new Kinshasa Methodist Church Orphanage Project is complete and they can be transitioned to that new home. 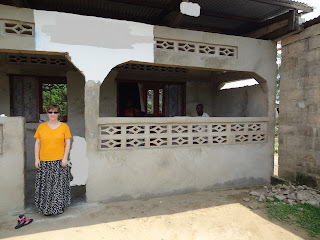 Front of Our Family Orphanage. One of the things that is so exciting to me about project is this home will specialize in the care of infants and toddlers. They are the children that have the lowest survival rate in a traditional DRC orphanage setting. 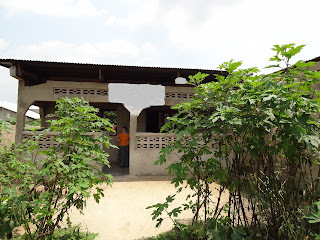 Most orphanages that we have visited in Kinshasa don't have cribs, don't have a supply of baby formula, and don't have the man power to care for children under 3 years old. Until a child can feed themselves and use the restroom independently, they are at the mercy of caretakers. And if there aren't enough caretakers (or no one who really cares) they fall victim to neglect, malnourishment, disease. If they make it past 3 years old they are little shells with lots of damage inside. But this home will be different. First of all, it will be staffed with caregivers that really do care. How do I know? Because I saw it with my own eyes. The moment we stepped out of the van and into the front yard two woman came up and whisked Katriel and Louise out of our arms. They cooed and kissed and tickled my girls like a couple of long lost aunties. These weren't hard hearted orphanage workers, these were family. And I feel confident that every child that steps foot in that home will be part of this amazing extended family. That is a huge piece of what is missing in most traditional orphanage settings. A body that is hungry for food will starve, but so will a soul that is hungry for love and nurturing. Side of home with baby clothes already drying. Second, since this will be a home funded exclusively by OFA donors we can insure that the children are getting the most nutritious food possible and medical care when needed. We can also insure that our funds are being used appropriately. We don't have to worry about funds being misused or supplies being re-sold. We know and trust the people running this home. They are Christians in every sense of the word. OFA has a long time relationship with the director and these are people who have an amazing heart to help the children of DRC. My favorite Mama loving on Katriel. Back of home and security wall. The day we visited the home they had just received their first two children the day before. A tiny infant and a sweet toddler boy. The inside of the building is small but clean and cool. The children's beds had mosquito nets. A nice sturdy security wall surrounds the building. It has the feel of being way out in the country and there is plenty of room to grow. There are still lots of improvements to be made to the facility, but so much potential. They plan to install a line to the city water so the mamas don't have to haul water by hand and so an indoor bathroom can be completed. They still need more furniture, lots of toys, all the baby "necessities" that we take for granted, and lots and lots of formula! But they have the most important element in great abundance. Love and attention. Like I said, I've seen it with my own eyes. Supplies delivered by last OFA travel group. Of course, if we are going to make miracles happen half around the world we need your help. Right now an amazing new group called Forgo.It has chosen OFA as it's featured fundraising project. Forgo.It is this cool new app for your phone that let's you make small (or large) donations on the spot. The premise is if you happen to be out at a restaurant, for example, you can "forgo" the appetizer and send what you would have spent to Forgo.It which then donates that funds to OFA. How cool is that! So this weekend when you are out on date night with your hubby "forgo" the dessert (and the extra calories) and send it to OFA. "Forgo" the popcorn at the movie theatre. Next week, "forgo" that pedicure. Ride to work with a friend and "forgo" the gas money you saved. So easy, so cool, so important! This week, Grace and I "forgo'd" buying a cake from the bakery for Louise's birthday and we baked one at home instead. For the month of June, Our Family Adoptions and in particular "Our Family Orphanage" will receive all funds donated to Forgo.It. And the deal is even sweeter because we have some very generous donors who will do matching donations up to $6000!!!! That means if we can get $6000 in donations we will actually be able to supply "Our Family Orphanage" with $12,000. Oh my goodness, what amazing things could be done with that kind of support. Look at how happy Katriel is just thinking about $12,000 in donations for her Congolese brothers and sisters! If you're reading this post you are very possibly one of the amazing people who helped support my adoption and made it possible for Katriel and Louise to become part of my family. You have a big heart. You love children. You want to make a difference in the world. So go ahead and do it one more time. Just a few dollars at a time. A coffee here, a trip to the drive-thru there. Forgo.It and make that difference. I've been there. I've seen it. I know what miracles you can make happen. Join me in helping them happen again and again in the lives of the children at the "Our Family Orphanage". Those children and this project are about as near and dear to my heart as my very own kids! JoJo is confused and says "Doesn't everybody want to help kids in Congo?"